Mix the mirin, sugar and soy sauce on a shallow dish that would hold 4 pieces of salmon, and marinate the salmon in it for 3 minutes in one side and 2 minutes on the other side. Meanwhile heat a skillet on the stove. Cook the salmon in the dry hot pan for 2 minutes , and then turn it over, add the marinade and cook for another 2 minutes. Remove the salmon to whatever plate you are serving it on, a. . .
1Mix the mirin, sugar and soy sauce on a shallow dish that would hold 4 pieces of salmon, and marinate the salmon in it for 3 minutes in one side and 2 minutes on the other side. 2Meanwhile heat a skillet on the stove. 3Cook the salmon in the dry hot pan for 2 minutes , and then turn it over, add the marinade and cook for another 2 minutes. 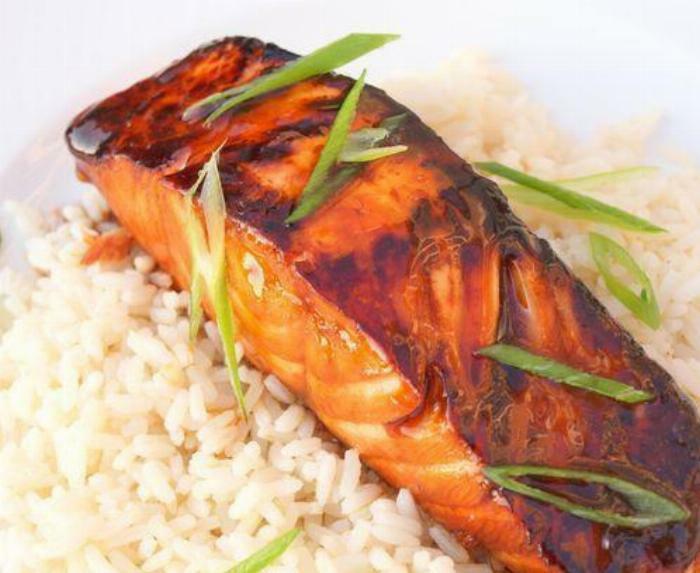 4Remove the salmon to whatever plate you are serving it on, and add the rice vinegar to the hot pan. 5Pour the dark , sweet, salty glaze over the salmon and top with the scallion strips. Serve with rice or noodles as you wish , and consider putting some sushi ginger on the table too.